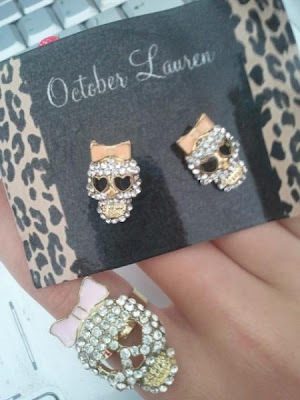 They were sent to me from October Lauren a cute little online shop with some amazing little pieces!! Follow their Twitter/Facebook for updates! While i was away on holiday andrew did some shopping and got me the best presents ever! and they were in the sale! Hi! I tried to write to you on IFB but there's something wrong there. I like your blog, i think it's new. We can support each other by following each other via GFC! and follow if you like. ~Ive Followed you on bloglovin and GFC!!! love the ear rings, they are so cute! Your skirt is pretty cool and the skull accessories are amazing!